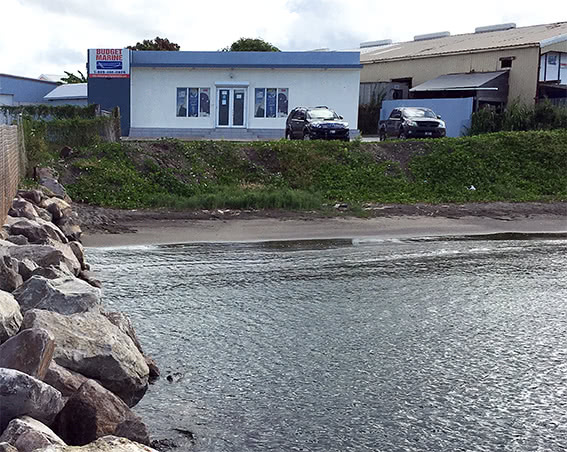 Budget Marine St.Kitts is located in CAP Southwell Industrial Park near the Basseterre Fisheries Complex on the waterfront. We offer a large selection of chandlery items, anything we don’t have can quickly be brought in from our Budget Marine Headquarters in St. Maarten. Ample customer parking and access to the fishing port dinghy dock close by. We will build a dinghy dock soon! Duty Free pricing for visiting yachts. Just bring in your boat papers and ID. Give one of our Gift Certificates: The perfect boaters gift. They are available upon request and can be purchased from the cashier. Arrangements can be made for delivery of bulk buys and heavy products to St. Kitts Marine Works or down in Christophe Harbour, as and when the company vehicle is available. Give the store manager Phil Matthews a call at 1.869.466.0026 and he can arrange delivery to your boat. We accept US and EC dollars. Prices in the store are listed in ECD dollars. Customers must open a credit account with Budget Marine St.Kitts. Credit extended from other locations is not valid here. To apply for a credit account, please come in to the store to complete the credit account form. We accept local, bank draft and traveler’s cheques. The price stated on our website are in US dollars and applies to the St. Maarten location for those customers that are Yacht In Transit, Export Customers or Non Residents that provide proof of this status. Prices in St.Kitts will vary due to local taxes and duties as well as different shipping costs. We are committed to giving you the best possible pricing.